Enjoy cultural, historical, and culinary exploration during your holiday in Bangkok, the capital of Thailand and the most populous city in the country. You'll explore and learn at Jim Thompson House and Bangkok Art & Culture Centre (BACC). 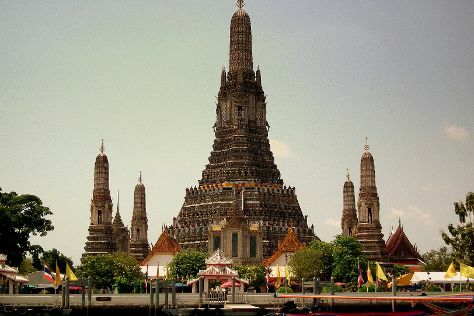 Get a sense of the local culture at Temple of Dawn (Wat Arun) and Wat Pho. You'll find plenty of places to visit near Bangkok: Ayutthaya (Ayuthaya Ruins & Wat Mahathat). There's lots more to do: explore the historical opulence of The Grand Palace, take in the spiritual surroundings of Wat Saket, shop like a local with Chatuchak Weekend Market, and contemplate the waterfront views at Chao Phraya River. To find maps, more things to do, photos, and tourist information, you can read our Bangkok holiday planner. If you are flying in from United Kingdom, the closest major airports are Suvarnabhumi Airport and Don Mueang International Airport. Expect a daytime high around 39°C in July, and nighttime lows around 30°C. Finish your sightseeing early on the 31st (Mon) to allow enough time to travel back home.